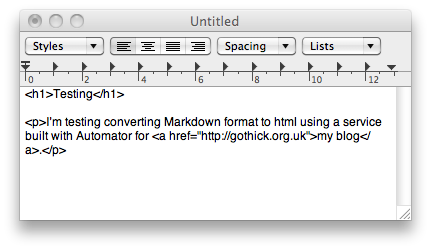 I just had a quick look around the web for ways to install Markdown translation as a Service (i.e. available from the Services menu) on my Mac. Most of the hits I got seemed to be quite old, and involved hacking about with an existing service for another text converter. So, I experimented. And the good news is that since Snow Leopard came out, with its improvements to the Services menu and Automator support, adding Markdown conversion to the Services menu yourself is an absolute doddle. I took a guess and what I did worked first time. First, fire up Automator. Choose “Service” as the template you want to use. 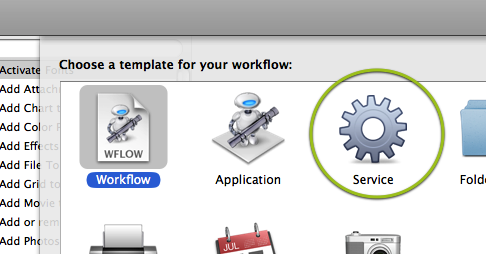 Verily, the ease of adding Services to OS X using Automator these days is a draggy droppy joy. Fantastic! 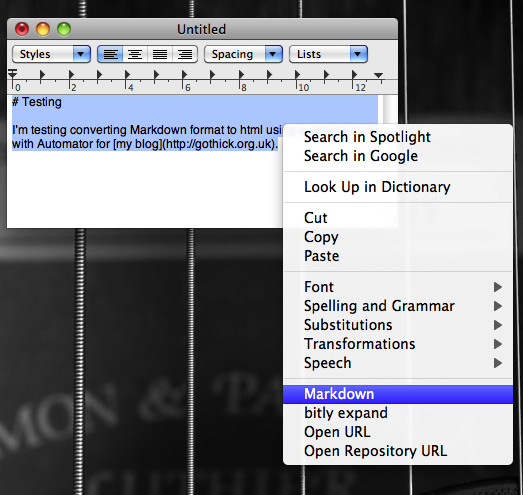 This really makes writing in (Multi)Markdown day‐to‐day very compelling. 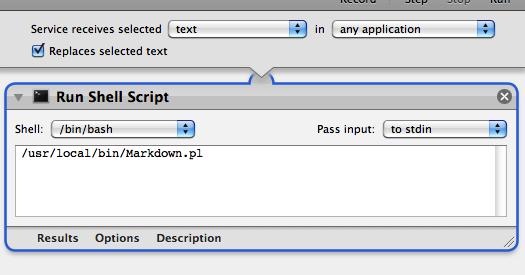 I’d normally use a TextMate bundle to do the conversion before posting to TwoStopsDown, but now it’s just a keystroke. Also, pro tip: works in MacVim just as well as it does anywhere else in OS X. This is awesome! I also went through the same process for adding a HAML and SASS service.